Healthcare organizations are under tremendous pressure to increase the quality of care they provide, improve clinical outcomes and control their costs. 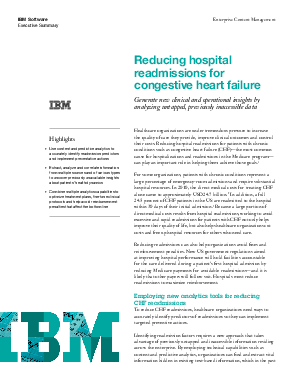 Reducing hospital re-admissions for patients with chronic conditions such as congestive heart failure - the most common cause for hospitalizations and re-admissions in the Medicare program - can play an important role in helping them achieve those goals. Read this white paper to learn about generating new clinical and operational insights by analyzing untapped, previously inaccessible data and more.